Chemical/ Small Molecule (Trinitrophenol) conjugated to KLH. The ab18412, RTK2071 immunoglobulin reacts with KLH and was chosen as an isotype control after screening on a variety of resting, activated, live, and fixed mouse and human tissues. Our Abpromise guarantee covers the use of ab18412 in the following tested applications. 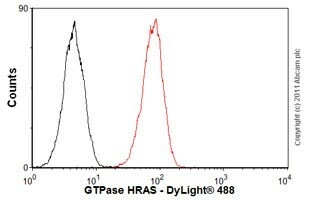 Overlay histogram showing HeLa cells stained with ab16881 (red line). The cells were fixed with 80% methanol (5 min) and incubated in 1x PBS / 10% normal goat serum / 0.3M glycine to block non-specific protein-protein interactions. The cells were then incubated with the antibody (ab16881, 1µg/1x106 cells) for 30 min at 22ºC. The secondary antibody used was DyLight® 488 goat anti-rat IgG (H+L) (ab98386) at 1/500 dilution for 30 min at 22ºC. Isotype control antibody (black line) was rat IgG1 [RTK2071] (ab18412, 2µg/1x106 cells) used under the same conditions. Acquisition of >5,000 events was performed. This antibody gave a positive signal in HeLa cells fixed with 4% paraformaldehyde (10 min) used under the same conditions. Publishing research using ab18412? Please let us know so that we can cite the reference in this datasheet. A link to each of those MSDS will be shortly available from the product datasheets. This usually takes a few hours up to one day, delay that is necessary for the cache of the website to be regenerated. I hope these documents are useful to you. Do not hesitate to contact us again if you have further questions. I wish you good luck with your research work. I put in this email all the reference for which I need a MSDS. I would like to inform you that we are currently dealing with your request. I will contact you again as soon as the requested documents are available.